I’m calling from Windows Service Center. … he says with a strong Indian accent. We’ve had a report that your computer has serious virus problems. He proceeds to instruct me to look at my keyboard and navigate my computer. The goal: to have me hand over remote control of my computer to “fix” the problem. I told him to … Well, never mind what I told him. No legitimate company will cold call you and offer to “fix” your computer right then and there. NEVER allow someone who you don’t know, through a phone call you did not initiate, to take over control of your computer. It may be hard to imagine that criminals — and that’s exactly what they are — could be so brazen to actually call you up and install nasty malware on you computer, while you sit right there and help them do it. But it’s going on. Be suspicious always. They ARE out to get you. I didn’t record my call, but here’s an interesting Youtube description of how the call would proceed, IF YOU WERE TO BE SO GULLIBLE AS TO FALL FOR THIS. Be careful out there in the wild. It’s a scary world. 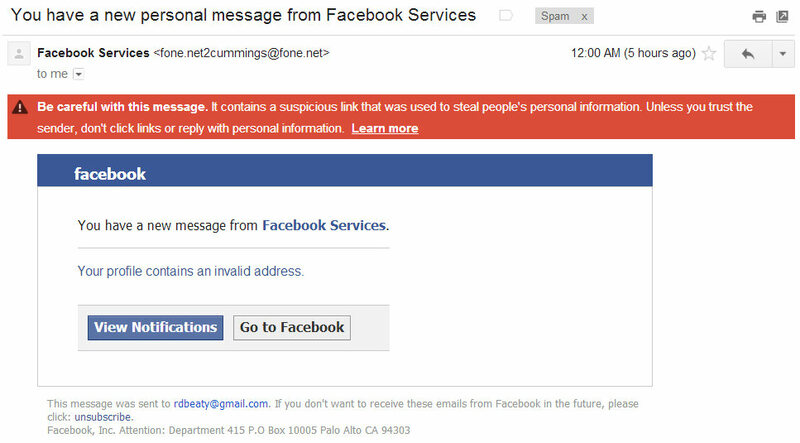 Got this in my email this morning, supposedly from Facebook … NOT! Don’t fall for this one. If you have doubts whether a message is legit, hover over a link and check the URL at the bottom of your browser. Don’t click anything that you are not 100% sure is legitimate. Even the unsubscribe link is bogus. Hereby you are notified that your Income Tax Refund Appeal id#5499970 has been REJECTED. If you believe the IRS did not properly estimate your case due to a misunderstanding of the facts, be prepared to provide additional information. You can obtain the rejection details and re-submit your appeal by using the instructions in the attachment. Oh, yes … the “attachment.” The attached file is disguised to look like a web page, but it is actually an attached file. Click on it and … who knows. You can count on malware of some sort. Be careful out there in a computer world where attacks on your security and privacy are common place. While this email is pretty obviously bogus to anyone who is looking carefully, it is tax season. Hence, this one could get you, if you were seriously concerned about the message.